This service is going to provide you some rank pushing niche relevant contextual backlinks. First of all we are going to develop 10 pieces of unique content that will be around 500 words in length. All content will be 100% unique and will include images and a video where possible. This service is going to provide you some rank pushing niche relevant contextual backlinks for your business. Then we will set up 10 brand new Web 2.0 accounts. Each Web 2.0 property will have your keyword in the sub domain name. In the report at the end we will provide you with the login details to these blogs for you to use again and again. After the Web 2.0 sites are set up we are going to post the content to them. Each site will have a unique piece of content posted to it, we will not post the same content to each site like many other sellers do. After that we will add a backlink to your website. All 10 Web 2.0 blogs will backlink to your website, therefore you need to provide us with 10 anchors upon order. We will also link the Web 2.0 sites up into a link wheel to prevent them from being an orphaned page. 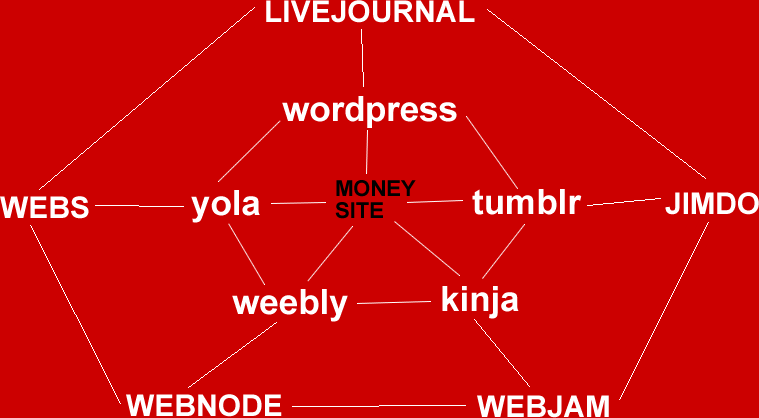 All 10 Web 2.0 sites will link to your money site. Please note that it is possible that we might use different Web 2.0 platforms that is shown in the image above depending on what is available at the time of order. This strategy is super effective, it gets your site niche relevant backlinks from high authority domains. If you are looking to push ranks this is the way to go. Each and every Web 2.0 site in Tier 1 will get 2 backlinks from the other Web 2.0 sites in your two tier link wheel set up. Each and every Web 2.0 site in Tier 2 will get one backlink from another Web 2.0 site on the same Tier. This way your main website gets 10 quality backlinks. The sites that backlink to your main website get backlinks too, all in one go. Setting up your Web 2.0 sites into a link wheel ensures that the sites get indexed and most importantly remain indexed. We will submit one of the Web 2.0 sites to Google Console for you. This site will hit the index, when it does the rest of the sites in the whole link wheel will follow. We will index one Tier 2 web 2.0 site to make this happen. All we need from you is your website URL and your anchor text, we will do the rest. You can sit back, smile and watch your site rank up.